Through the door into the church, dim after the sunshine outside. Two steps in, dip my middle finger into the cool water held in a small metal bowl hung on the wall at shoulder height to me, waist high to my parents. Breathe deep the scent of old incense and candle wax, imprinted indelibly on the wood and my mind. Walk forward; trying to get as close to the front as I can before Dad’s hand drops on my shoulder. Genuflect, and then slide into the pew to wait and fidget. Mass – flowing and weaving through ancient tradition and modern practice. Scripture – voices from the past that speak to my heart and soul, even as a child. The comfort and ease of the ritual – standing, sitting, and kneeling in choreographed worship – brings the focus I so rarely have. The homily begins, focus falters. Father Brady’s Irish brogue whispers over my head, as I read ahead to next week’s scripture…and the next…and the next. “I believe in God, the Father almighty, creator of heaven and earth…” the words flow, spoken music, telling the story of my faith. Then the heart: the chalice and the plate and two glass containers – one water, one wine. “The Lord be with you.” One voice, strong and sure. “And also with you.” Many voices, in verbal and spiritual unison. Each prayer, each response moving us closer to the moment and carrying me with it. A pause, waiting for the next step. “This is the Lamb of God who takes away the sins of the world. Happy are those who are called to his supper. Kneeling, simulating meditation as I listen to the thump of padded kneelers being flipped up out of the way as the pews empty to join the line to receive the Eucharist. The dry wafer on my tongue, stuck to the roof of my mouth as I kneel. Through the doubts and questions and searching, the words and the ritual never fail. Catholic or Methodist, contemporary or traditional. The heart remains and the soul remembers. Forever and ever, Amen. Oh, how I loved church (still do)! One of my first disappointments was in discovering that girls couldn't become priests. The sights and scents and sounds have combined to create a strong sense memory that I can access any time, any place - unlike my memory of where I've left my cell phone...which is still lost. Thank you for visiting and comments and constructive criticism are always welcome! I don't ever remember wanting to be a priest, but my girlfriend and I used to put our beach towels tight on our heads and make believe we were nuns. Calling ourselves sister Jennifer Lynn, sister Mary Frances and so on. I still to this day always bless myself before entering the ocean (like holy water)a habit from all our "nun play" at the beach when we were children! PS I am friends with quite a few nuns who would love to be priests! Whoa....taken all the way back....my 1st communion, knowing all those prayers by heart. There was an Irish Monsignor, in our parish and when he would say "and also with you" it sounded like "And also with jew" and as kids we would laugh and laugh! LOL See how tough I am? I deleted my OWN comment! Jen - Father Brady did try to make it up to me by telling me I could be a nun. Thing is...we didn't have any nuns in our area so I didn't know what that was. I thought he was saying "none" (I was six or seven), and I KNEW I didn't want to be that! Now I'm a certified lay speaker so when our pastor is gone, or when a pastor at any other church is gone, I can write and give the sermon. I love it! This was a really powerful memory! I love how fast paced the writing was. Also? I adore that this is still something important to you today. The memory really stuck and that shines through. Galit - we went several years without a church when we were first married. Hubby's family really didn't "do" church, and we had no transportation to get there. Going back was like sliding back into my skin. I like how you try and create the present tense experience of the mass. Ritual is all about the now. It is interesting, isn't it, how repeating these words from memory frees us to experience more of the service? Wow. Very nice. I love the way you wrap this up and the way you bring up doubts despite the fact that your faith appears to be "printed indelibly" upon you. Nicely done. this was a wonderful look into attending mass. I grew up catholic too, and recently began attending again after a 16 year absence. I'm so glad to read this from your perspective!! I love how you interspersed the meaningful bits of prayer and ritual with the mundane bits such as your father's "guiding" hand on your shoulder, or the thump of the kneelers being flipped up. It's interesting how some people are turned off by the simple act of ritual, and feel that it takes away from the meaning, while others use the ritual as a way to find the meaning. You're so good with the memoir prompts! This time I figured out the in-line commenting. I really like that. You write with such detail. I love the message here as well. You vividly expressed my memories of a Catholic child who grew up and into the faith. Thanks for this wonderful walk down memory lane. I never thought about it, but you are right, those moments every Sunday become a part of your consciousness. 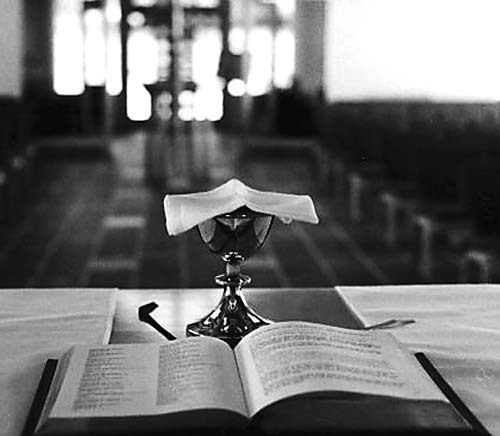 I like your details about the holy water and priest's voice. I was sitting right there with you. I am not and never have been a church goer. But your memory decribes a beautiful feeling. Your faith comes through so clearly. I love the way your words weave the whole together.